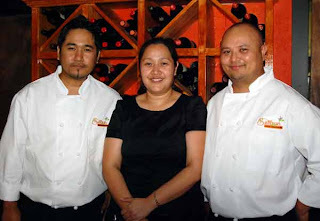 I decided to revisit Saffron, especially after reading a silly critique from the local Daily News newspaper's entertainment and hopeful high school and middle school sports staffers, pressed into service now, as a newbie food critics. These fast food trained, clearly inexperienced young palates had an impression that just really missed the mark, ordering dishes at Saffron with similar saucings, then complaining about the similarity! Don't get me wrong, this Daily News duo really might do ok at reviewing birthday party entertainment and food at ChuckE. Cheese, or comparing frozen TV chicken dinners for the Daily News, until the Daily News hires an experienced food critic. 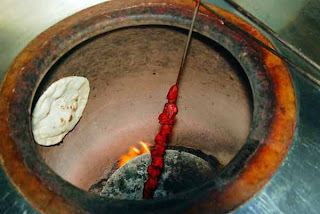 Thus, I came for a second review, a reality check, with another couple that lived and cooked in India for decades, and understood, appreciated and explained the distinctions between the cuisines of the different regions of India. On this Tuesday night, off-season, there were some 25 people served, a showing that topped some of the more popular places along 5th Avenue in Naples. Walking in, we breathed the delicate scent of the fresh Indian herbs and spices, and peered over the shoulders of other diners to see what they had tried! Pallavi Rai Rimal welcomed us, and was our server, matching our tastes with the luscious creations of her husband Chef Raj Rimal, and her brother, Chef Pravir Rai. We tried a different assortment of goodies from that on our first visit to Saffron, and after starting on Tiger Beers, had the Paneer Kulcha appetizer ($3.95), a round flat bread freshly baked in the Tandoor oven, filled with a good layer of homemade paneer cheese, sliced cooked yet still crunchy onions, a touch of coriander and cumin seed. We dipped our wedges in the fresh, alive cilantro and mint chutney dip.. A great way to whet an appetite! Highly recommended! 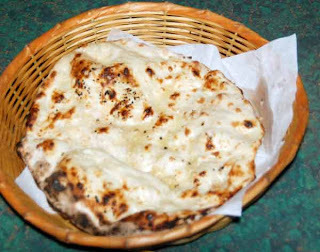 We sampled the super fresh regular Naan (2.95), and I preferred the additional taste of the delicate garlic naan's generous garlic bits (3.95), with both naans presenting a large piece of truly tandoor-fresh naan! 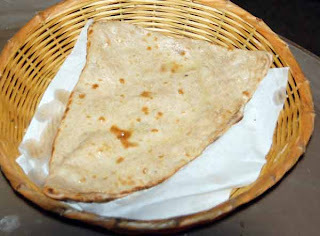 For comparison to the white flour Naan flatbread, we had the Paratha (2.95), a buttered flat wheat bread. All three breads disappeared, sopping up sauces! 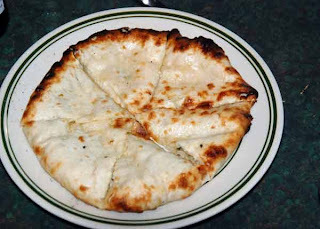 Then the Spinach Dip (8.95), where deep fried crisp naan slices are spread with the chopped spinach, cream cheese and paneer dip, that is garnished with toasted bread crumbs. Tastes way better than my simple description, also highly recommended. The Mulligatawny soup (4.95) was vegetarian style, had a lentil base thickened with chick pea flour, mild to moderately spiced, and best with a squeeze of lemon. This was better than the version we had upon my first visit. 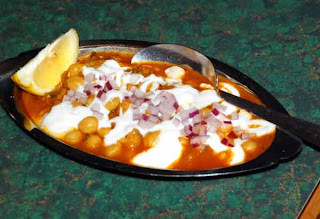 I did forget the precise ingredients of what followed, as the plates arrived together, starting with the Channa Masala, with its base of garbanzo/chick peas in a rich cilantro and ginger root accented sauce, topped with tiny diced red onion, and garnished with fresh homemade yogurt. MMMM! 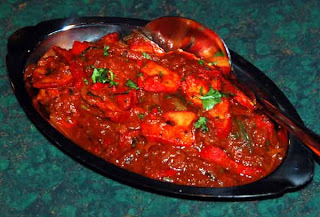 My favorite was the Chicken Tikka Kadai, (14.95), a kicked up version of the venerable British -born favorite Chicken Tikka Masala, with a unique moderately spicy tomato and ginger garlic paste with onions, hints of jalapeno, and a touch of garam masala, forming a thick sauce that bathed and coated the bright red sliced of tandoori chicken. This is one of Saffron’s most ordered dishes. Gotta get it! 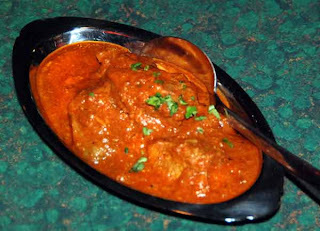 The Lamb Vindaloo (17.95) is one of the hottest spiced dishes, a 10 on their 10 scale, and still not as hot as I’ve had vindaloos elsewhere, where one’s eyes teared and mouth burned. I’m quite happy with Saffron’s level of heat! (This moderate heat overwhelmed the inexperienced palates of the Daily News Duet, who never should order anything over "mild" to begin with.) The thick onion-tomato sauce contains red chili peppers, generous hunks of lamb, and potatoes, and is not for the uninitiated! A touch of lemon juice brings out the rich flavors. 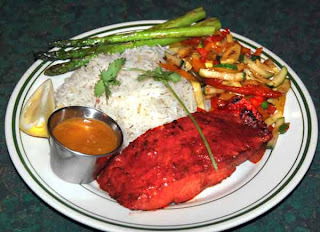 The Tandoori Salmon special is a welcome treat, putting the intense heat of the tandoor oven briefly upon the tender fish, and serving it with tender rice, asparagus, and a medley of vegetables. Dipped into a roasted tomato chutney, with hints of cilantro and garlic, it offered a ligher contrast to the richness of the sauces of other dishes. Kadai Gosht (17.95), offered a milder contrast to the vindaloo, and it’s tender lamb is mixed with chopped onions, tomato and garlic. The homemade Mango Kulfi (5), with in season fresh mango pulp, and a touch of condensed milk, was th ideal way to end a feast! Check my February 17, original write up on Saffron! 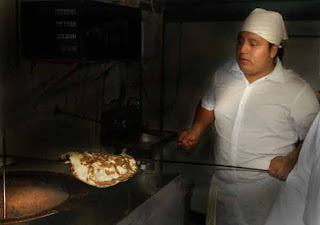 Exotic and fascinating cuisine. Thank you for your input. Dissapointed after going there.... Haven't you tried their biryani? It's horrible. Try making a third visit and order Biryani. Seriously. Its Horrible.